Lighten your cocktails with a homemade sweet and sour mix. Juice the lemons and limes, which should result in about 1.5 cups of each. Pour through a mesh strainer in to a large pitcher, removing the seeds and pulp. Bring 3 cups of water to boil and add the Truvia, stirring until dissolved (creating a simple syrup). Pour the simple syrup + 2 cups of cold water in to the pitcher and stir until well combined. 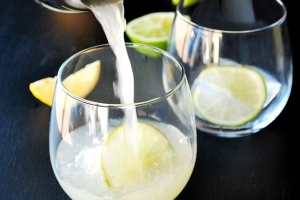 Add 1/2 up of sour mix to 2 ounces of your choice of liquor (vodka, whiskey, and tequila work well), shake over ice, and serve.